The top photos is of Marina Beach. This beach is unique. It is lined with a bazaar of shell products, handicrafts and other odds and ends. You can also take a pony ride here and go to Anna park where a statue is. The park is not so well known. It is to the north side of the beach and has a nice statue of ARINZAR ANNADURAI - leader of the Dravidian movement- inside the park. It is green, clean and uncrowded, unlike the beach. 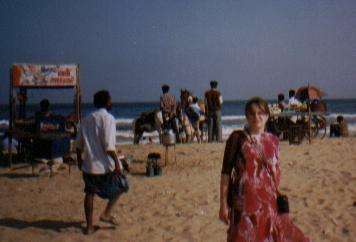 This beach is famous as it is the second largest in the world compared to Miami Beach, but it is not the best in Chennai. For that, go to Besant Nagar Beach. That is the local night time hangout for college kids. It is clean, lighted and full of restruants and shops. 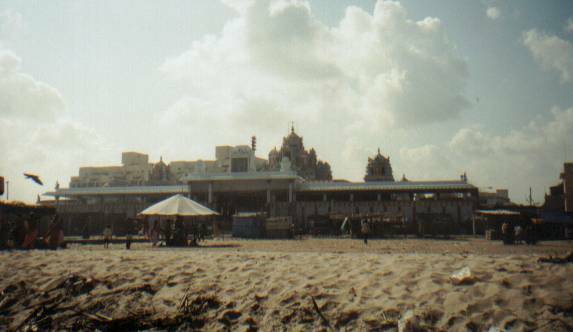 The bottom photo, of the Asthalakshmi temple is situated on a side of Besant Nagar beach. This is not the same side as the hangout mentioned above. This side is clean, but still not as clean as the other side. The temple is nice to see. I have yet to go inside. It is closed in midday, when I went there. Family Photos of Beaches in Kerala and Tamil Nadu - Cherai, Kovalam, Velli, Varkala, Kanyakumari. This page has been visited times since September 2001. Reviewed May 2004, December 2007.